The MISCO PA201 Handheld, Laboratory Quality, Digital Brix Refractometer is a valuable instrument for determining the sugar content in fruits,vegetables, juices, beverages, and in wine and beer making. It is also used extensively as a base scale for measuring non-sugar fluids such asmetalworking fluids, lubricants and industrial chemicals. Range 0 to 56 Brix, Resolution 0.1%, Precision +/-0.1%. The Palm Abbe refractometer is fast, convenient, and easy to use. Simply place a drop or two of fluid in the stainless steel well and press a button.The custom-designed microprocessor delivers a nearly instantaneous readout in degrees Brix. Nonlinear temperature compensation is automatic and ensuresthat fluids read between 0 and 50 °C (+32 to 122 °F) are measured accurately. 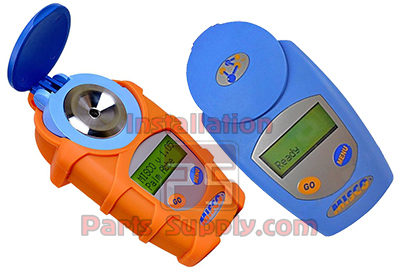 The Palm Abbe PA202 is a dual scale digital refractometer with scales for measuring both Brix and Refractive index.The PA202 measures Brix from 0 to 85 Brix, which is considerably higher than the Brix scale in the PA201.Brix is a measure of sugar concentration but is also used for measuring the concentration of many other fluids such as metalworking fluids,industrial lubricants, and other industrial chemicals. Also included in the PA202 refractometer, is a second scale for measuring the refractive index of a fluid. Refractive index is a physicalproperty of a fluid that is related to the speed at which light passes through it. The denser the solution, the slower light passesthrough it and the higher the refractive index. The Palm Abbe refractometer is fast, convenient, and easy to use. Simply place a drop or two of fluid in the stainless steel well and press abutton. The custom-designed microprocessor delivers a nearly instantaneous readout in degrees Brix. Nonlinear temperature compensation isautomatic and insures that fluids read between 0 and 50 °C (+32 to 122 °F) are measured accurately. The large backlit LCD display is easily read, even in dim light, and removes the subjectivity associated with interpreting where aboundary line crosses tiny scale divisions. And, it is so easy to use! The user interface consists of two buttons, one to take readings andthe other to step through various menu options. Calibration is automatic and does not require the use of special calibration solutions or tools. The Palm Abbe refractometer automaticallycalibrates itself to water and is ready to use in seconds. No more screws to turn and nothing to adjust. .